Millennials think things in the country are off on the wrong track but at the same time, they're optimistic about their own futures, according to a new NBC News/GenForward survey. Nearly two-thirds of millennials (63 percent) think things in this country are off on the wrong track. Only 18 percent think the country is generally headed in the right direction, and another 18 percent aren't sure. Sixty-three percent of millennials also disapprove of the way President Donald Trump is handling his job, with nearly half (46 percent) saying they strongly disapprove. Only 2 in 10 (19 percent) approve of Trump. Even among those millennials who said they voted for Trump in the 2016 presidential election, 22 percent disapprove of him now. At the same time, a majority of millennials (61 percent) disapprove of the way Congress is handling its job. Millennials also hold an unfavorable view of the Republican Party (62 percent). Only a quarter (24 percent) have a favorable view of the GOP. The Democratic Party is viewed more favorably, but millennials overall are still split — 44 percent favorable to 43 percent unfavorable. 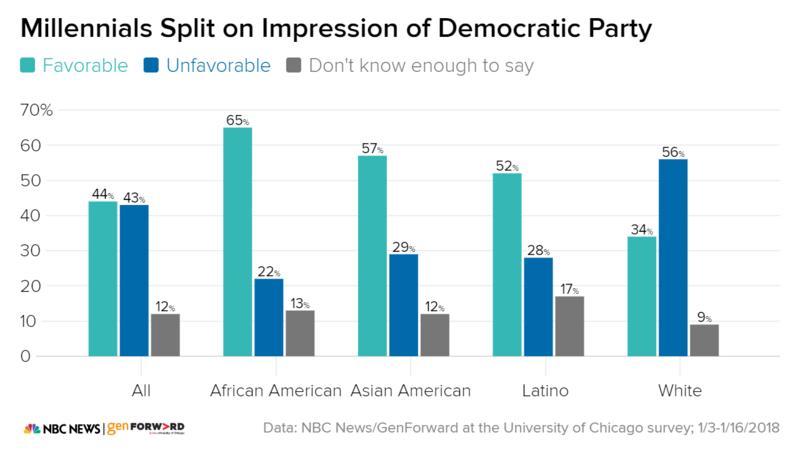 There's also a racial divide when it comes to the Democratic Party. African-American millennials view the party more favorably (65 percent) than any other racial subgroup. Majorities of Asian Americans (57 percent) and Latinos (52 percent) also view the Democratic Party favorably, but only 34 percent of white millennials have a favorable impression of the party, with 56 percent holding an unfavorable opinion. Still, 85 percent of millennials overall agree that the government is run by a few big interests looking out for themselves and their friends. That attitude is shared across racial subgroups. When it comes to voting, candidates' positions on the issues are much more important to millennials overall (71 percent) than their personal qualities (22 percent) or party affiliation (5 percent). This suggests that millennials care more about policy than politics and could translate to their lack of excitement about either party. There is a slight difference among African-American millennials. They care more about a candidate's personal qualities (29 percent) than do Latinos (23 percent), whites (21 percent) and Asian Americans (19 percent). 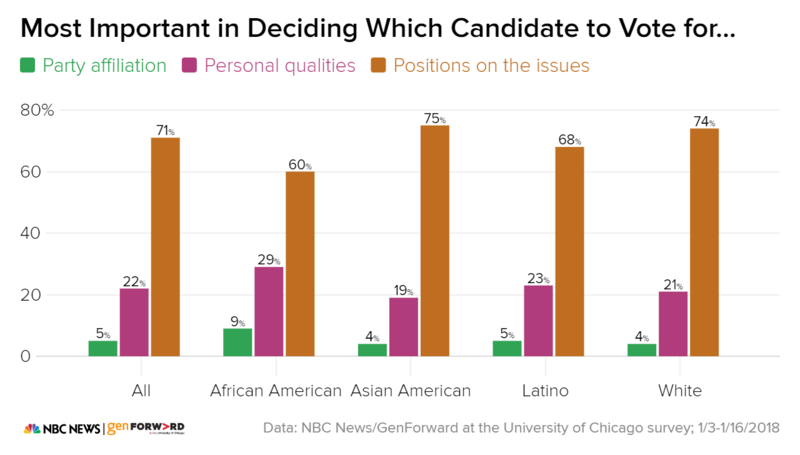 Still, 6 in 10 African Americans said a candidate's positions on the issues is most important in deciding for whom to vote. Looking ahead to 2018, half of millennials said they were planning to vote for or were leaning toward voting for the Democratic candidate in the congressional midterm elections, and a quarter said they were planning to vote for or were leaning toward the Republican candidate. Overall, a quarter of millennials said they were neither planning to vote for nor leaning toward voting for either party's candidate, suggesting that those millennials may not vote at all. Similarly, 12 percent of millennials who are eligible said they've never voted — of those, a majority (53 percent) said they're not sure they'll vote in the 2018 congressional elections. Millennials are also relatively split on the ability of elections to produce change. Only a slight majority (53 percent) of millennials feel elections are effective in producing real change in the country, and 45 percent feel elections aren't effective. While millennials may be distancing themselves from traditional political institutions, the survey shows that they haven't given up on the country's future. Three-quarters feel the efforts of organizations and groups working in communities can be effective in producing real change in the country. By a whopping 22-point margin, millennials think organizations and community groups are more effective at producing real change in the country than elections are. Millennials also have an optimistic view when it comes to their own political efficacy. Six in 10 think they have the skills and knowledge necessary to participate in politics. Across racial subgroups, Asian Americans (49 percent) and Latinos (58 percent) were less likely to say that they have the skills and knowledge to participate than African Americans (63 percent) and whites (62 percent). Sixty-three percent of millennials also think that by participating in politics, they can make a difference. 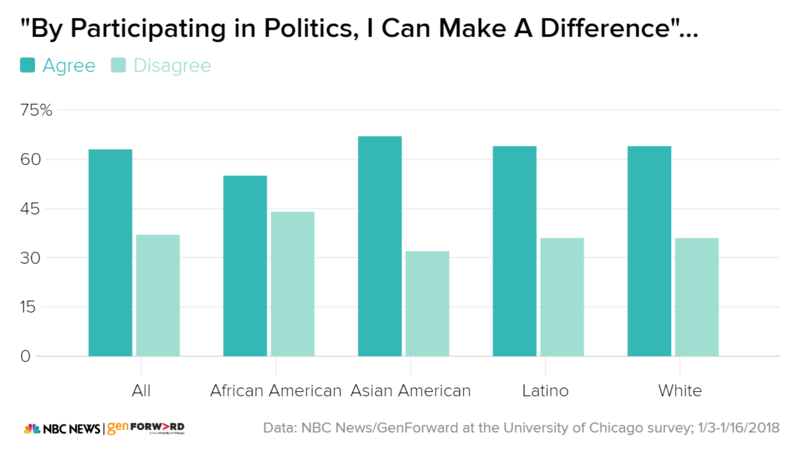 African Americans were less likely (55 percent) than Asian Americans (67 percent), Latinos (64 percent) or whites (64 percent) to agree that by participating they can make a difference. However, majorities across racial subgroups were optimistic about the impact of their political participation. 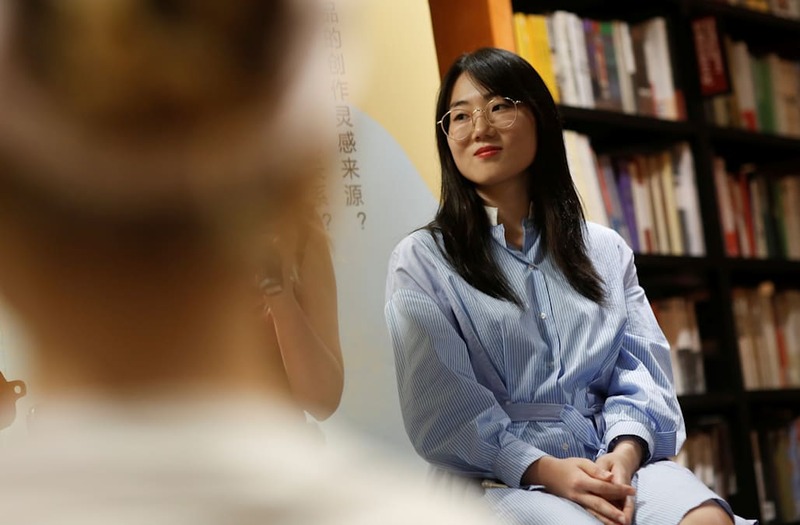 And when it comes to their own personal futures — thinking about things like finding and keeping a good job, paying off student loan debt and being able to afford the lifestyle they want — 59 percent of millennials said they're optimistic. So millennials are hopeful about themselves and the future — but their disillusionment with government suggests that their engagement in the 2018 midterms isn't guaranteed. 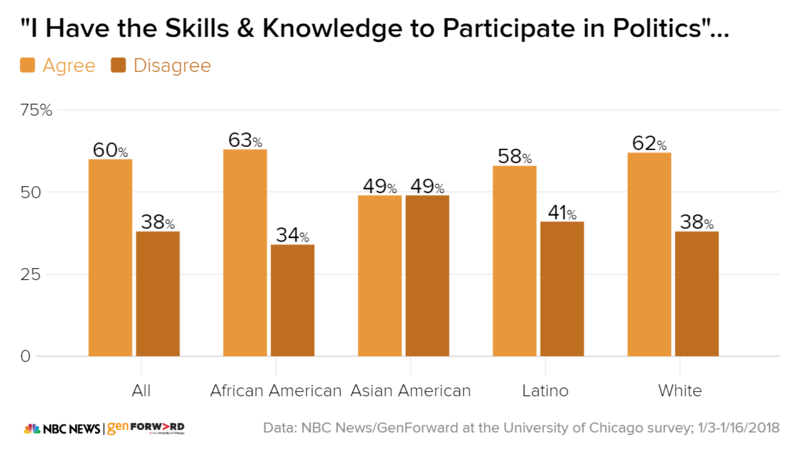 The NBC News/GenForward at the University of Chicago Survey was conducted Jan. 3-16 among a nationally representative sample of 1,844 adults ages 18-34, recruited and administered by NORC at the University of Chicago. The overall margin of sampling error is +/- 3.95 percentage points. For full results and methodology, click here.